Region – Kentucky – Special pick by and for Gordon’s Fine Wines– Single Barrel # 514 Rick House “T” – Floor 6, 55% ABV (multiply ABV x 2 to get “proof” – I really prefer the use of ABV, less multiplication, and more direct – come on America!!!). 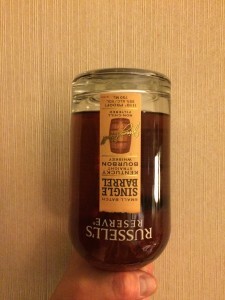 A week or so ago I reviewed a single barrel pick of Russell’s Reserve by and for Warehouse Liquors in Chicago. 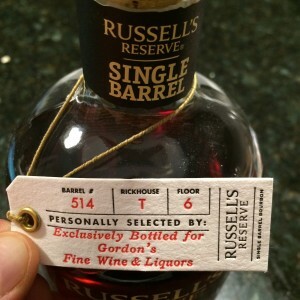 As promised in that post, I’d be reviewing the RRSB bottle I purchased at Gordon’s Fine Wines. Spoiler alert — I really enjoyed this single barrel pick. 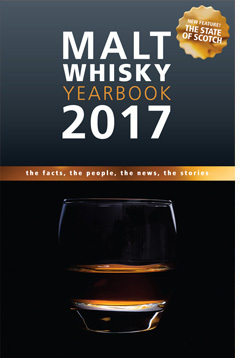 It was the first RRSB that ticked all the boxes (as far as ‘Murrican whiskeys go) for me. 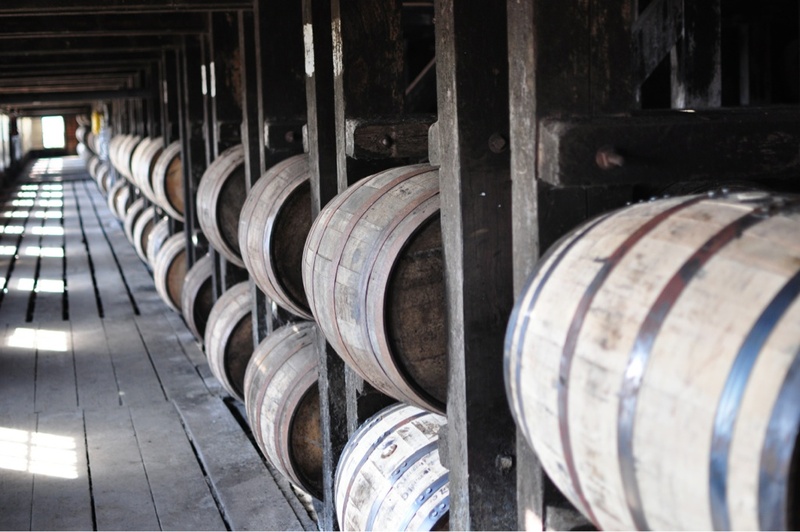 On the nose — A hot, dank, and damp warehouse with wafts of charred oak in the air. Heavily spiced, and warmed apple sauce. Getting pop corn (like with the Warehouse barrel pick) but the corn has yet to be popped. Whole kernel, yet buttered, and it’s specifically the smell of the taste of these whole kernels. 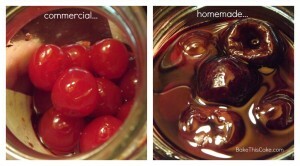 Baking spices, damp earth maraschino cherries. In the mouth — Corn bread with jalapeño, and a honey glaze. Very sweet, yet spicy verging on hot. 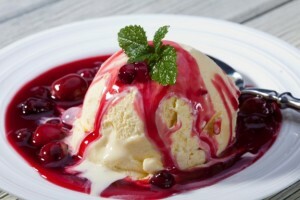 Maraschino sauce over melting vanilla ice cream. The mouth feel is *that* thick. Tasting notes aside, this is an easy drinkin’ whiskey. Back to tasting notes (broad brush), there’s some wonderful rye spice as we near the finish. Finish — Very long with specific notes of sugar & lime on a white kernel corn cob. In sum — Like I said, I really enjoyed this whiskey. It’s an easy drinker. There really was not need to dissect this as it’s the type of whiskey that you could mindlessly enjoy. At the same time, it can be picked apart to discover wonderfully delicious notes. Region – Kentucky – Special pick by Gene at Warehouse Liquors – Single Barrel # 922 Rick House “N” – Floor 5-3-3, 55% ABV (multiply ABV x 2 to get “proof” – I really prefer the use of ABV, less multiplication, and more direct – come on America!!!). I bought this bottle on the suggestion of Warehouse Liquors store proprietor, Gene. If you’re ever in Chicago, Warehouse Liquors is a sight for sore whisk(e)y eyes. Like Binny’s, Kenwood, Antioch (and many others… the list could go on, really), Warehouse Liquors is a whisk(e)y destination that helps put Chicago on the map. Beyond the store itself (300+ ‘Murrican whiskeys, and 650+ single malt whiskies, Scotch and otherwise), it is Gene himself that puts Warehouse liquors on the map. A fountain of knowledge, that one. 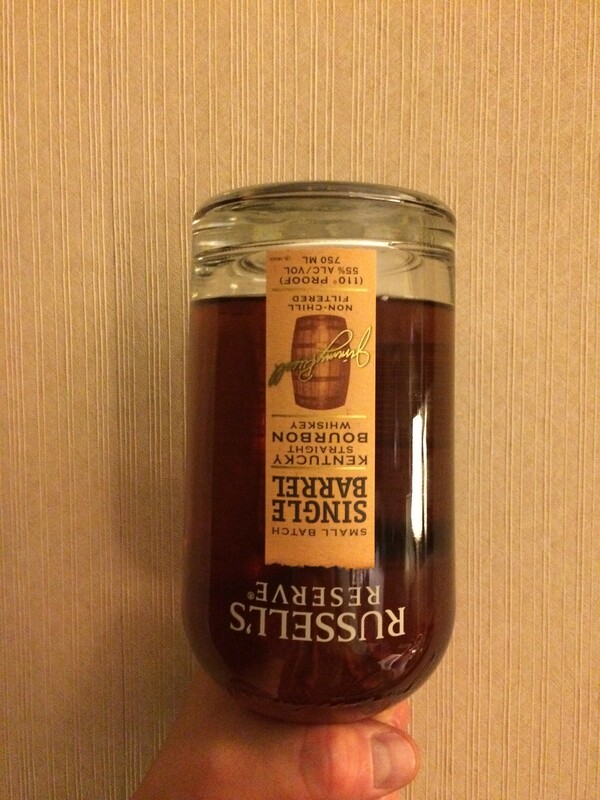 Ok, so, the whiskey… I have never, ever, been a fan of the Russell’s Reserve Single Barrels. Most people love these releases but it tends to not fit my flavor profile. Each to their own, right? However, Gene is one of those in the whisky industry that I trust. His knowledge, his taste, etc… He’s been able to gauge my palate pretty well, and he’s done so in a fairly quick fashion. So, when he suggested I buy this RR SB that he picked, I said no (the first time). Did I mention that I just don’t like RR SBs? So, against my better judgement based on the releases I prefer to stay aware from, but in favor of my judgement on Gene, his selections, and suggestions based on his knowledge of my palate, I pressed ahead and got a bottle. 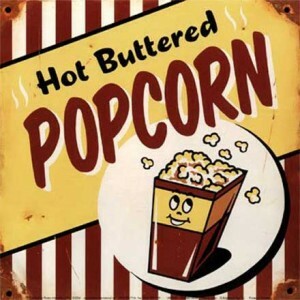 On the nose — The first note is big, and it is buttered popcorn (and not a bowl of cherries, as I assume to be smacked with when it comes to the RR SBs). The nose is a little hot, which is to be expected (potentially) given the 55 ABV%. After a couple minutes in the glass, the heat goes away (far away), and I detect cooked tangerine skins, citrus pith, crushed vanilla pods and soft oak. Surprisingly, given that this is a #4 char (which is a heavy char, by the way), I’m not smacked in the face with oak. This makes me happy as the grains are fully present here, as are bourbon soaked cherries (subtle note, and yum!). There’s a cologne note here, too. Elegant. Not Axe, not old spice, something old worldy. 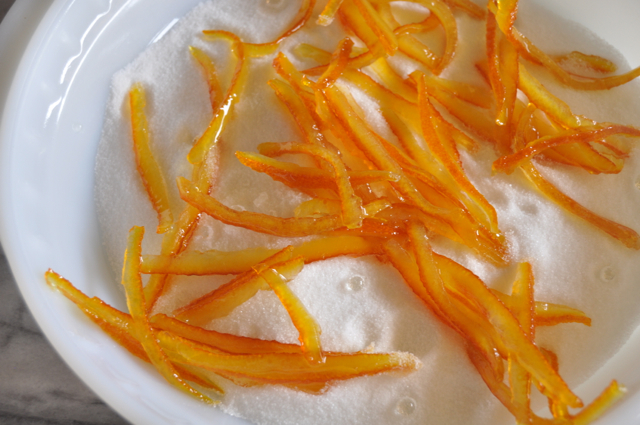 Wow, now there’s a note of turkish delights, too (rose water, pistachio and powdered sugar). Call me happy so far! In the Mouth — *Easy* entry, oily mouthfeel. Slightly herbaceous but balanced by candied orange peel and stewed fruits. I can not stress this enough – the mouthfeel is fantastically unctuous. Because this is not smacking you with oak, this whiskey demands that you focus on the grains. So, let’s do that, shall we? There’s a corn sweetness here that makes me pine for autumn. 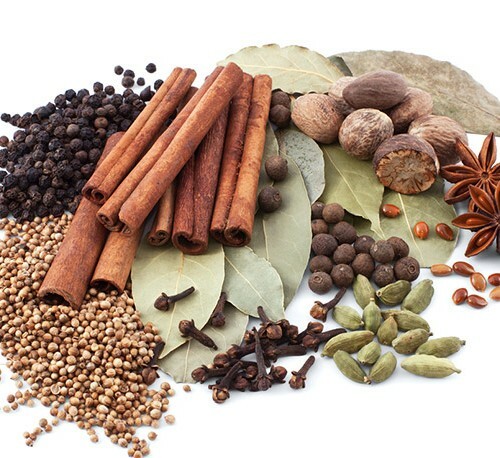 Subtle rye spice, hints of caraway. Maraschino cherries (real homemade ones, not that jarred stuff you find everywhere). Finish — Hints of citrus, spice and soft oak. Slightly tannic, and medium in length. In sum — Either I’m starting to dig RR SBs or I’ve found two this year that I like (the other being from Gordon’s Fine Wines out of MA – review to follow shortly-ish). What I really enjoyed about this one was that it wasn’t all wood and cherries. This is complex, and a fine pick that brings you out of your bourbon-comfort zone, and challenges you. Not that bourbons aren’t challenging. Rather, the oak tends to make flavors dense. And with this one, it’s all about the grain with oak as a component instead of a dictator. This one is a drinker and worth the $$ paid, no doot aboot it. Thanks for pushing me, Gene. You were right. Great barrel selection!